Union Beach, NJ (June 20, 2013) – Vanguard Logistics Services is pleased to report that employees raised over $12,000.00 and donated the funds to families affected by Hurricane Sandy. Union Beach, NJ is a small town of 6,200 working class residents where 1,600 of the town's 2,100 homes either suffered storm damage or were completely destroyed by Hurricane Sandy during late October 2012. Vanguard USA employees held donation drives at the start of 2013 over a few months to help the families who were affected: 535 T-Shirts were sold nationwide and raised $5,090; NYC Gift Auction raised $2,945; NYC & CHI Super Bowl pools raised $1,400; Rancho Jeans Thursdays raised $1,018; Nationwide Pajama Day raised $600; Corporate Jeans Thursdays raised $429; Rancho Cupcake Sales, NYC Baseball Day & NYC 50/50 raised a total of $563. "The original goal was to raise $5,000 that would be used to supply building materials directly to families affected in Union Beach," commented Cyndi Wolf, National HR Manager. Through the generosity of USA employees and their involvement in the fundraisers, Vanguard ended up raising over $12,000! 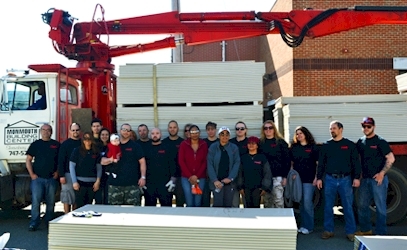 Some Vanguard NJ employees even volunteered to help deliver building supplies to the homes on their day off. "The weather was perfect and everything went smoothly. The Vanguard team was happy to be there to help haul sheetrock and insulation into the homes. The homeowners were very appreciative and, understandably, some were very emotional. All in all, it was a great feeling to be able to help them thanks to our employees collectively donating over $12,000," concluded Wolf. Vanguard was officially thanked in a letter sent by Paul J. Smith, Jr., Mayor of Union Beach, NJ. Vanguard Logistics Services provides a global network of owned and third-party internationally renowned Non-Vessel Operating Common Carrier (NVOCC) brands. Vanguard's global coverage now extends to over 525 points of presence operating in more than 100 countries. Vanguard's global ocean freight volumes make the organization one of the largest global sea-freight consolidators in the world. Vanguard Logistics Services and Vanguard are trade names of Vanguard Logistics Services (Hong Kong) Limited in Hong Kong. Vanguard Logistics Services and Vanguard are trade names of NACA Logistics (USA) Inc. in the USA.